ERP is Only Part of a Business Solution | ERP the Right Way! Back in the 80s Enterprise Resource Planning (ERP) was deemed the panacea for business pains caused by operational inefficiencies and disjointed applications. Then came the realization that ERP was not the final solution but just one piece of the puzzle. In addition we learned that change was not just a software issue, that implementation is not the same as installation, and that the cost of ERP is not a one-time expense. Above all we learned that ERP is only part of a business solution. 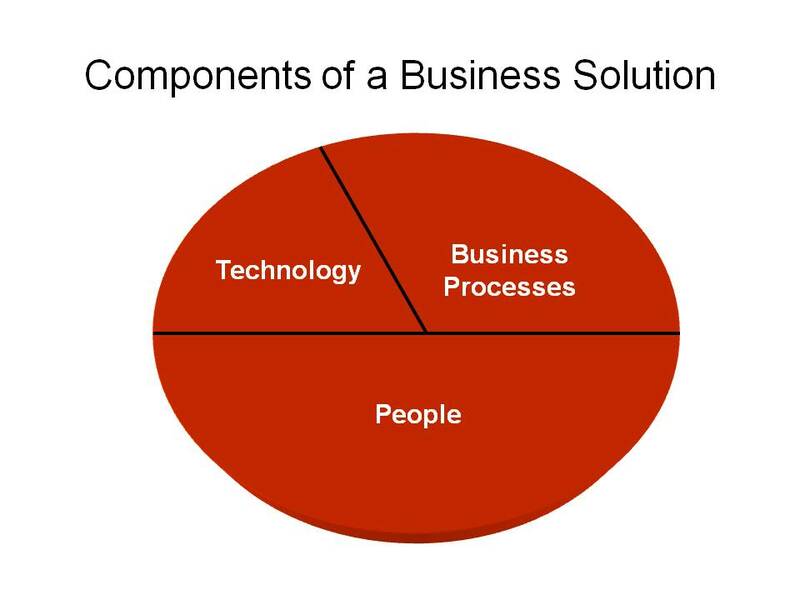 What is the most important component of a business solution? Now here is something interesting to consider, “Do we need all three components to have a solution for business?” Let me rephrase it this way “Do we need software in order to conduct business?” I am persuaded to say that the answer is no. Business was being conducted before the invention of the computer. However, I am quite aware that not having software a part of your business is impractical given today’s competitive marketplace. I do want to demonstrate that software only supports and therefore can only have a certain level of benefit to a business. ERP software does not have the capability to make key business decisions. It is key business decisions that drive business results. Business software like ERP can provide information and data to assist people in making business key decisions. Seen in this light we can conclude that people are the most important component of a business solution and people have the greatest impact on the success of a business solution. 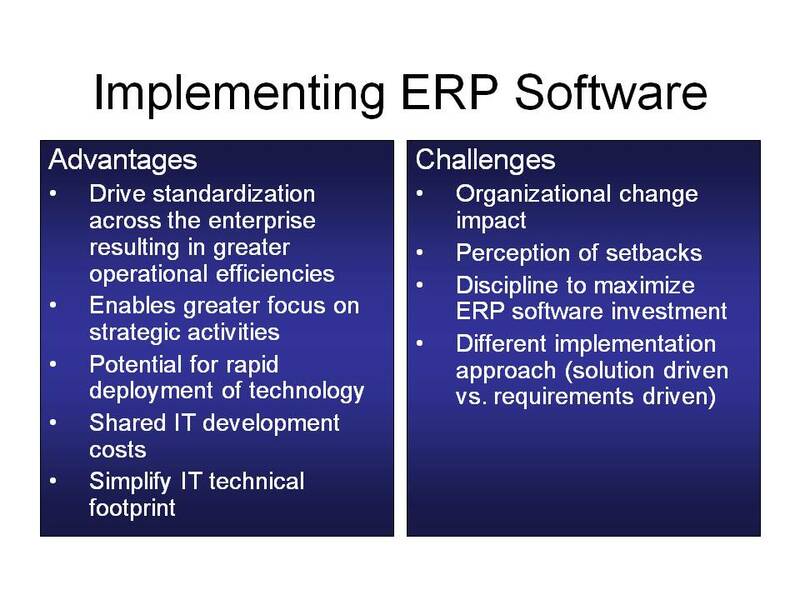 Funny how it is interesting to note that the majority of ERP implementations mostly focus on products and technology. Let’s dig a little deeper and spend some time speaking about each business solution component. People are the single most important factor that will determine whether a business solution is a success or a failure. People can also be the most challenging component to deal with in a business solution. Let’s be honest, you can hardcode software to do exactly what you want that product to perform, people are a different story. The upside to keep in mind is that people have the potential of generating the greatest value in the context of a business solution. What is a business process? I have seen many definitions but I like the definition provided by Howard Smith and Peter Fingar in their book Business Process Management – The Third Wave (Meghan-Kiffer Press – 2002). A business process is the complete and dynamically coordinated set of collaborated and transactional activities that deliver value to customers. Complete: there is a beginning and end to a business process. Dynamic: responding to changing customer demands and market conditions. Result-Oriented: value is generated to your external customer. These basic characteristics must be addressed during business solution implementations in terms of needs assessment, requirements management, and validation (testing) of a business solution. We should not be surprised when business requirements change during an ERP implementation and we should plan for it accordingly. Software and technology encompasses the technical infrastructure, networking resources, and ERP software that will support the business solution. With ERP software there are inherent advantages and disadvantages as listed below. An effective ERP implementation strategy will maximize the inherent advantages of ERP while addressing or minimizing the inherent challenges. ERP is only one component of a holistic business solution. ERP can be a great platform for addressing business challenges as long as the technology is correctly applied. At the end of the day it is People, Business Processes, and Technology working together in unison to generate business results. Only when these components are judiciously utilized are business results maximized. Great insight… Years ago I read “Process Innovation” by Thomas Davenport and his basic premise was that technology is a change enabler. That thinking has strongly influenced my SAP career since 1994 and I focus heavily on the whole topic of SAP customers becoming more sophisticated and more knowledgable. Unfortunately there are too many “consultants” out there who have absolutely no idea of business and even less on how to use technology as a change enabler. there is a crucial point made in the post, i.e. a quality ERP is not the silver bullet if other parts of your company are not up to scratch. Absolutely agree, but I add an outer circle to represent the enterprise goals/vision/mission. You have to know where you are going; mostly – but of course you can still enjoy riding in circles :-). The point is that the “implementation” is in a relatively closed environment – supply chain notwithstanding – and the boundaries, which I believe you are defining, must be, err well.. defined! I recently divorced from a global erp supplier who gave lip service to knowledge transfer; simply putting the system in place, giving some rudimentary training and then walking away just doesn’t cut it – their steadily shrinking market space in Africa is a direct result of this but they just won’t be told. A dinosaur symptom. Pingback: Conducting ERP Assessment to Maximize ERP ROI « ERP the Right Way! Pingback: Business pain can be good for ERP « ERP the Right Way! Pingback: Is Cloud Ringing the Death Toll for ERP? « ERP the Right Way! Pingback: Business to IT Alignment – A Practical Discussion | ERP the Right Way! Reading this info So i’m satisfied to show that I’ve an incredibly good uncanny feeling I found out just what I needed. Pingback: The Secret to Cloud ERP Utilization | ERP the Right Way!